Totton Angus is a family owned and operated ranch located north of Chamberlain, SD on the rough Missouri River breaks. Tanya and I were married in 1983 and have raised three children. Our two daughters are married and they along with our son regularly lend a hand with our operation. The entire family takes pride in maintaining a consistent, quality cattle production business. Getting to where we are today has certainly been a lengthy learning process. We feel our methods have proven it is not only possible to raise moderate framed Angus cattle, but is also an approach that garners excellent results and leads to profitability. To give some background about how we got to where we are today, I was born and raised in Norris, SD where the Badlands meet the sandhills and have worked in the commercial cow/calf business all my life. During the farm crisis in the 1980's and in between droughts, to be successful, we felt we had little choice but to become a low cost producer. In the mid 1990's we began to see a niche in calving ease and maternal cattle, while the rest of the angus seed stock producers were trying to compete with continental cattle for growth and carcass. With our purchase of a bull named Moderator PC 4034, we were very pleased to discover it was possible to have calving ease, maternal cattle and fleshing ability all in one package. We started buying registered heifers in 1995. The term "moderate frame", wasn't cool at that time and had not yet become popular. I could pick my 4-5 head out of a herd and pay less than average due to the fact they weren't as large as the other heifers. We purchased 21 registered heifers over the years and have bred them to have a herd of over 200 head. Over the past few years, calving-ease has now become a quality in high demand. In the early years we were a cooperative producer for a nationwide bull marketing group before deciding we wanted to stay local and get to know our customers as well as become more efficient in our marketing methods. Once we became aware of the benefits of calving ease and maternal cattle, we perfected our process, rather than chasing other fads that have come and gone. Some specific cattle management practices we incorporate into our operation are: low stress cattle handling, across the fence weaning, cull all open cows and heifers and utilize mob and swath grazing approximately 10 months of each year. We know Mother Nature does not always cooperate, so we anticipate excessive snow about twice every decade, at which time we will have to feed during the winter months. 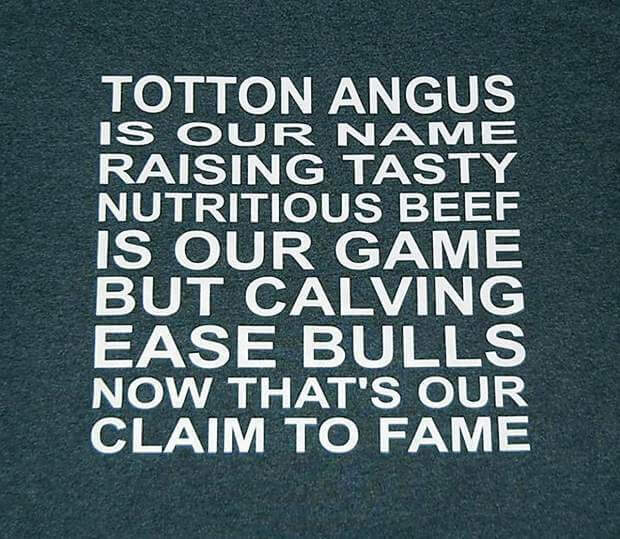 Totton Angus raises a few grass-fed heifers every year and the moderate framed cattle work very well for this, as well as producing exceptional meat. Our most recent challenge is buying registered polled hereford heifers and breeding them to become as maternal as the angus cattle. We are dedicated to the extensive planning and practices of breeding high quality cattle that serve the best interests of our customers. "I made an attempt to walk three miles every night in preparation for the race," said Charles with a chuckle. "It was a really positive experience overall. I have a daughter, brother and dad who are veterans, so this is a pretty easy thing to support. I think it's important for everyone to support our troops, with everything that's going on in the Middle East. We need our military men and women to serve, and they need to know we stand behind them." Charlie Totton explaining his mob grazing system at a tour last July to SDSU and UNL researchers working on a joint South Dakota-Nebraska mob grazing project on 13 producer sites. Charlie Totton and his wife, Tanya, operate a Black Angus cow/calf and breeding stock operation in the Chamberlain area. Intensive grazing during the growing season was a natural next step in their range management program. Their goal was to increase grass production in such a way that they improve their grass at the same time. 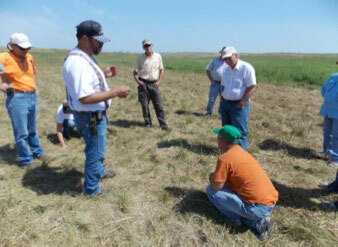 They specifically hope to encourage more big bluestem in their predominantly western wheat pastures. Starting in 2009, Totton divided a 640 acre section into 80 acre pastures, each with access to water. The paddocks are 1/2 mile long and 1/4 mile wide. He uses electric poly wire to section off each strip, starting with the one closest to the water. Each day's grazing covers about 4 acres with 200 cows, or 50 cow days/acre. He and Tanya spend 30 to 60 minutes every morning moving the fence from the beginning of July until Labor Day. Only 1/2 of the section is grazed during the summer. Yearling heifers flash graze the same ground the following spring, adding another 10 cow days/acre. Translated into animal units, they utilize 1/2 acre per AUM. The other half rests, allowing the grasses to grow and reseed. The rested grass is then used for winter grazing. After four years, Totton estimates that grass production has nearly doubled. They haven't increased the stocking rate, but have used the extra grass to extend their grazing season deep into the winter. "It's an idiot proof system," said Totton. "You don't need a PhD in Range Science to do it." They feed hay during the March and April calving season. The extra winter grass allows Totton to bale up crop residue, producing a good drought cushion. Even with only 11 inches of rain in 2012, they didn't need to destock. Totton hopes the current weather patterns bring enough moisture to get through this year without destocking, too. Their yearling heifers offer an extra drought cushion. If it's dry when they start AI at the beginning of June, they can be sold rather than breeding them for later sale. By feeding only two months of the year, he's also cut the time and energy used to cut and bale hay. Totton figures that moving cattle daily is still less time consuming than putting up more hay. They keep a winter's worth of hay on hand, just in case. Some results of the intensive grazing program surprised them. One surprise was the wide variety of plants that cattle will eat. The herd even ate their way through an entire draw full of poison ivy. Totton also learned to be careful about what he hated. Flash grazing was supposed to control what they thought was an overabundance of Ken- tucky bluegrass. Then he discovered that it often stays green under the dead grasses, providing decent winter grazing. The down side of intensive management is the daily chore of moving the fence. Totton can stretch grazing to two days, but that's it. The other is the need for more water development. "Increasing grass is a slow process," said Totton. He feels that intensive grazing produces a faster response than his previous management practices did. What's An Old BUll Worth? This is about a bull nicknamed Vindicator. He looked a lot like the bull in the movie "The Rare Breed", hence the nickname Vindicator. Vindicator had been around for 3 or 4 years doing his job when an issue arose registering one of his daughters. So I called the Association and they said just send some DNA and we'll get it straightened out. I got him in and poked him til he bled, put the blood on a cute little card and sent it to a lab in Lincoln, Nebraska. About a month later we got the results back. To my surprise he didn't match the sire on his registration papers. Now we have a bull with an identity crisis. We went from having problems registering his daughter to his papers being canceled. This annoyed me to no end. I just wanted to get rid of old Vindicator. Just my luck, the local sale barn closed last spring. We thought about hauling him west across the river to a sale barn but then we remembered they have those grumpy old brand inspectors, you know the guy standing by the load-in chute with a big hat, bushy mustache and a scarf tied around his neck and kind of looks like he just stepped out of the late 1800's. They have no sense of humor about selling a bull with someone else's brand on him. You see he was a boughten bull and we never got around to rebranding him. It annoys me every time I see him, he's got to go. So we decided to take him to a local meat locker and have jerky made out of him. Vindicator weighed 1890 lbs. alive. We got him dressed and we still had 1134 pounds hanging weight. Deboned and trimmed he weighed 680 lbs. Raw meat is 64% moisture and jerky is 1% moisture therefore you lose 63% of the weight in the jerky making process. Now we have 251 lbs. of jerky. Seems a little disappointing to start out with a 1890 lb. bull and end up with 251 lbs. of jerky. But on the other hand what the hell are you going to do with 251 lbs. of jerky. We know there is a South Dakota National Guard Unit deployed to the Middle East that has at least 4 soldiers with connections to the Chamberlain, SD area. We thought maybe some South Dakota jerky would brighten their day and let them know that people at home are thinking about them. At least this way we could salvage some bragging rights, and in the future we can advertise we sent a bull to the Middle East. So we called the State Family Readiness Group Coordinator to see if they could help us with logistics. They thought it was a good idea but they had one problem. They can only accept up to $1,000 donation per entity. Evidently they think old Vindicator is worth more than $1,000. Well, technically she is right. At the sale barn he is worth $.85 a pound, $1,606.50. I didn't quite know what to say to the lady. I'd been accused of a lot of things over the years but being accused of being too generous, now that was a first. We had talked to other people about helping with this project so we decided we needed to count up our entities. Well, there is Totton Angus who instigated the project, Old Vindicator was actually registered under Hoing Hereford Ranch, Dehaai Processing gave us a break on the cost of the jerky making when they found out we were donating it to a National Guard unit, the owner of Adamson Angus, Kore Cares of Sioux Falls and Thrivent Financial helped with the processing segment of this adventure, and the Hoing Racing Team procured the money for the shipping. So now we have 7 entities involved. We decided to go to the local C-Store to see if we were under the $1,000 per entity. We found a bag of SD made jerky about the same weight as we would be sending. It weighed 4.5 oz and cost $11.49. That figures out to be $2.55 per oz. or $40.80 per pound. Our 251 lbs. of jerky would cost $10,240.80. Not enough entities or we will have to find some jerky on sale. If I would have known Old Vindicator was worth $10,240.80 he would still be alive. We'd like some more calves out of such a valuable bull. 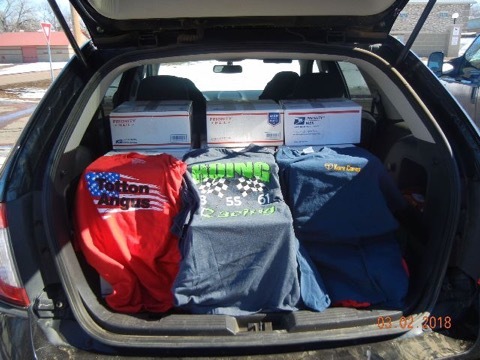 In the end, a total of 45 boxes (1,300 packages) of jerky were sent to the 91 soldiers of the South Dakota Army National Guard's Company C, 1st Battalion, 189th Aviation Regiment that are currently deployed in the Middle East. The soldiers were thankful for a delicious taste of home.